The mausoleum of Plancia Magna, a figure believed to have been the first-ever female mayor and a name frequently mentioned on the inscriptions of Antalya's ancient city of Perge, is currently being unearthed. In the excavation work of the 5,000-year-old ancient city of Perge in the Antalya province, the mausoleum of Plancia Magna, who lived 1,800 years ago and was known as the first woman mayor in history, has started to be uncovered. The mausoleum of the first mayor was discovered during a separate excavation conducted by the Antalya Museum Directorate. Initially, four steps of the mausoleum's platform were discovered during excavations led by Antalya Governer Münir Karaoğlu. Soon after, the excavation team uncovered the mayor's burial chamber, revealing exciting new information about Magna. The inscription on the exterior of the burial chamber includes details about the Plancius family, of which Magna was a member. Serving as director at both the Antalya Museum and the ancient city of Perge site, Mustafa Demirel told Anadolu Agency (AA) that the excavations in the main part of the city and in the mausoleum are ongoing with the project being conducted in cooperation with the Culture and Tourism Ministry. The words "Plancius Family" written on the facade of the sepulchre. While discussing Magna's significant contributions to the city of Perge that led to her name being forever associated with the city, Demirel said: "In light of the information received from the epitaphs unearthed during previous excavations, a mausoleum thought to belong to Plancia Magna was found. In line with the plan we prepared for this year, we started excavation work in the mausoleum." 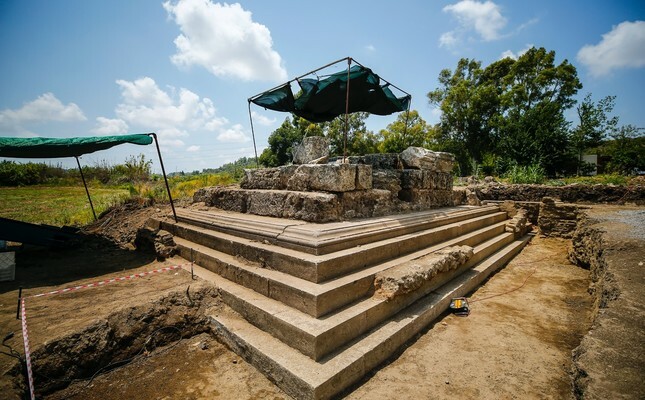 Noting a podium was discovered during the first excavation, the director reported that they are about to open the north and east part of the mausoleum and will open the south and west part, as well. He highlighted that they expect to unearth new epitaphs as well as architectural and constructional elements when the excavations are complete and added that they plan to document the whole structure. Mustafa Demirel said Magna was born to a family of Roman origin in Perge in the second century. "She spent all her assets on Perge and was deeply involved in the construction of the city. The people of Perge erected statues to honor her in return for her services and placed them around the city. We will continue with our scientific excavation work to uncover new information and reveal how Plancia Magna's mausoleum was made. Magna was the first mayor of Perge in the Roman period," he continued. Magna was the daughter of the Plancius family. Her father, Marcus Plancius Varus, was a senator and state governor. Ruling Perge for three terms, Magna spent her financial resources on the city and gained the love of the people through her generosity. Statements like "Plancia Magna spent her own money" and "She spent it without her husband's permission" are included in the epitaphs about her. The same writing also mentions her as the "Top Executive of the City," "The Nun of Artemis" and "The Imperial Cult Abbess," which demonstrates she had religious influence that parallelled her political and social duties. This also sheds light on why Magna, in addition to listing her administrative and religious duties, was called "The Girl of the City" in commendation epitaphs.